Please contact Lauren Wilcox at lwilcox@yceapa.org to be added to the waitlist. 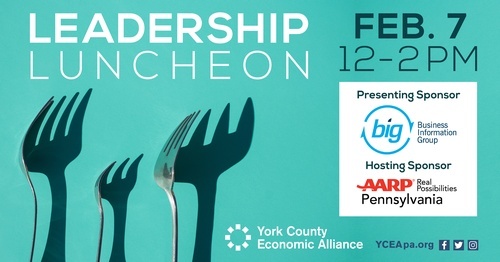 Join us for the 2019 Leadership Luncheon presented by Pennsylvania State Treasurer Joe Torsella, elected statewide in 2016 to serve as the Commonwealth’s chief fiscal officer. Treasurer Torsella convened a task force in 2017 to consider the plight of the millions of Pennsylvanians who have little or no retirement savings, many of whom work for businesses, both big and small, that currently offer no workplace retirement savings plan. The Treasurer will speak about the work of the task force and his thoughts on ways Pennsylvania can address this retirement savings crisis. Numerous recent surveys have revealed how little American workers have saved for retirement. This predicament has tremendous implications for individuals, businesses, and government. In today's volatile economy, efforts to encourage workers to save for retirement can help to provide stability for both employees and employers, lessening turnover and enabling individuals and families to better plan for their future. A number of states have created a way for workers to safely save for retirement through a state administered program. Operating much like a 529 college savings program, these accounts allow workers to have a portion of their pay automatically deducted and placed in an account which is tied to the individual. Employers have no responsibility other than to facilitate the automatic deductions. In 2018, AARP surveyed small businesses in Pennsylvania about their thoughts on such a program. At the same time, Pennsylvania State Treasurer Joe Torsella established a Task Force to examine the retirement savings problem and its consequences in the Commonwealth. Our program will give you an opportunity to learn more about this issue from the Treasurer.